UP a Land Rover track streaming with water I slosh, to a line of shooting butts on a Pennine moor; then a hundred and sixty paces east through blackened heather to a patch of grass in the middle of nowhere; and now kneeling down as cold rain falls barely noticed, I peel back turf from a grey slab that shines briefly as the sun finds cracks between clouds. 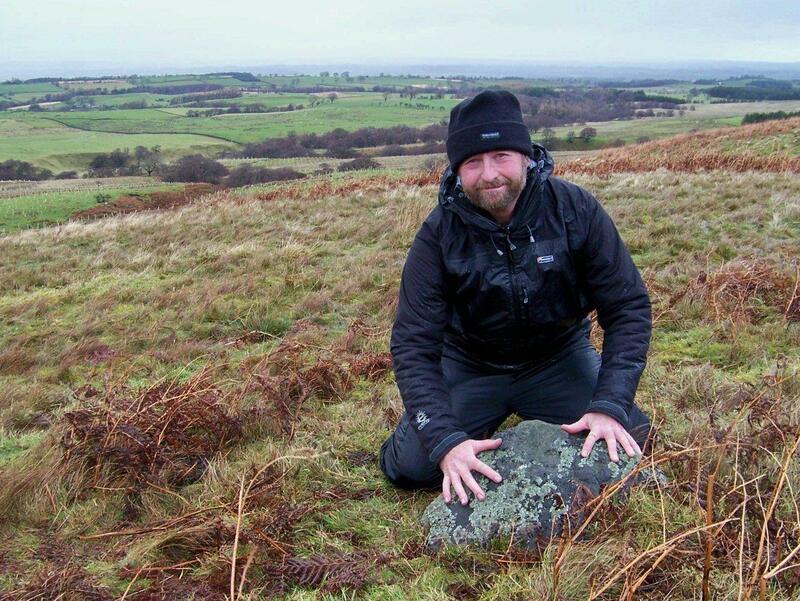 And here it is, naked, glistening and strangely unsettling – the elusive carved stone of Barningham Moor, festooned with rock art dating back to the Bronze Age . . . The carved cups, rings and grooves brim with water. Their significance is lost. We have no way of knowing exactly what was going on up here 3,000 years ago. This carved stone is a mystery in a mysterious place. The rain spatters and a cold wind blasts across the Pennines from Cumbria. But in this world of gloom a rainbow slices into the bracken at the foot of the slope. Perhaps it’s marking another hidden stone. Perhaps not. So I’m kneeling here in the heather, marvelling at this relic and thinking: just how did the artist chip away at that solid stone? What sort of tools did he possess? And what sort of bloke was he – a tangle-bearded, low-browed caveman dressed in ragged furs and wielding a big hammer? Or was he more sophisticated than that? Let’s explore this further because it might take us somewhere. Let’s conduct an experiment with a bit of Bronze Age role play. Right. I’ve been given a job as a Bronze Age stone carver. Yes, me. I’ve been told to carve a few holes and some squiggly lines. Nothing fancy. I can take my time. There’s no rush. Hang on. I’d better put that B&Q tempered steel cold chisel and two-pound masonry hammer back in my bag because iron won’t be along for about another 1,000 years. I need authenticity. 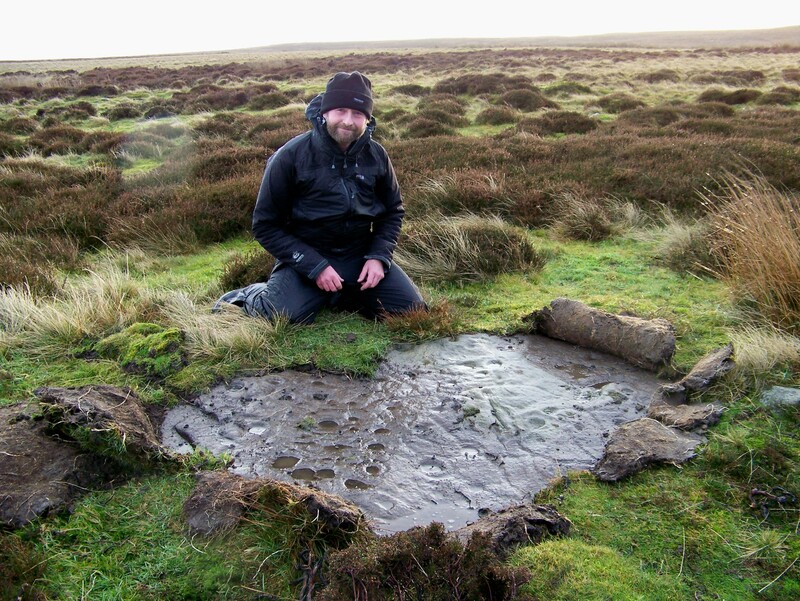 What I require is a material that’s harder than the limestone and gritstone lumps that lie scattered across this Pennine ridge, but something that was available in the late Neolithic and early Bronze Age period. Now there are a couple of things that fit the bill, and I’ll explore the oldest first because it had such an impact on how our part of the world developed. What is it? Greenstone tuffs from the Borrowdale volcanic series of rocks, quarried by Neolithic man from certain beds high in the Langdale Pikes for the production of stone axes. What I’m going to do is root through a pile of stones collected randomly from the Langdale Pikes. Can I tell which ones are suitable for the production of axes, bearing in mind I don’t possess a petrographic microscope to determine their mineralogical structure? No, I jolly well can’t. Neolithic man was a sophisticated bloke and has the edge on me in more ways than one. Not only did he discover some of the hardest rocks in Europe, he developed the means to quarry and shape them by hand – and alter the course of history. Hats off to Neolithic man. Hey-up, that stone needs carving and I still haven’t got a chisel. We’re in the early Bronze Age so there are new, super-hard materials on the market that can be lumped into a category called metal. Chief among them is copper. But these ancient guys have learnt, from techniques developed in the Near East, that when you mix a small amount of tin to copper you end up with a super-super-hard alloy called bronze. So I need some bronze for my chisel. Off I trundle in my ox cart for some copper and tin ores. But I haven’t a clue what I’m looking for or what to do when I find them. I know that the ore of copper is chalcopyrite – but I also know that, to the naked eye, it’s identical to iron pyrite, which is absolutely no use at all. Yet those Bronze Age chaps were experts in this sort of thing. 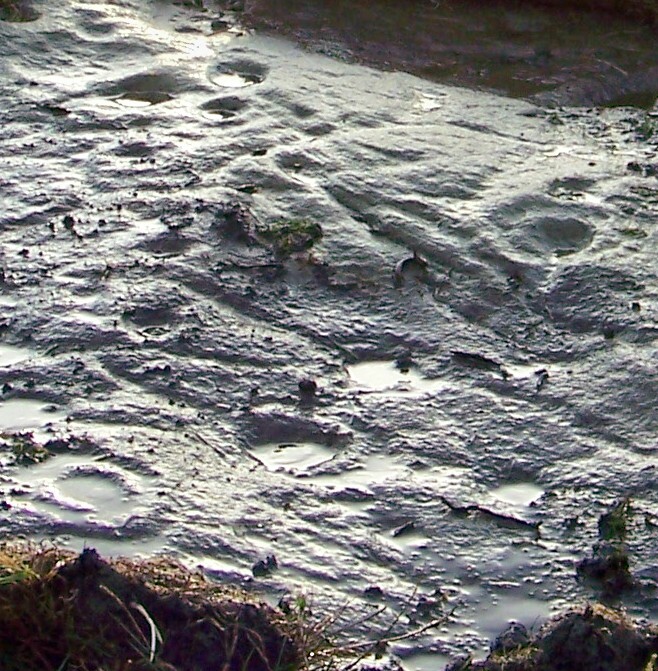 They knew what they were looking for and they knew how to mine it – which they did at several locations across England and Wales. And I’ve a feeling that for tin ore, cassiterite, which I wouldn’t recognise in a month of solstices, I’ve got to drive my ox all the way to Cornwall. And frankly I haven’t got time. Nor, if the truth be known, do I possess an ox. But what if I managed to trade some goods, perhaps some cabbages off my allotment, for a few sacks of tin and copper ore? How do I make bronze? Do I mix the ores together to smelt them? Or do I smelt them separately and mix the resultant metals? There’s a right and a wrong way, apparently. And will these Bronze Age chaps go for my cabbages – which won’t be introduced to Britain until the Celts swarm across the Channel in a few hundred years’ time? Now there’s a thought. My Ormskirk Savoys will seem like exotic vegetables. Is this getting a bit too complicated and longwinded, just for the sake of some grooves in a rock? What has become apparent is that our Bronze Age carvers weren’t low-browed cavemen; they were sophisticated, talented and knowledgeable people. 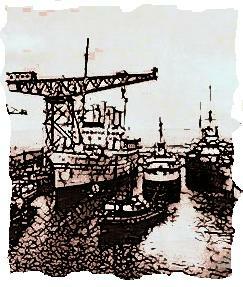 The carvers didn’t mine and smelt their own metals, of course, but they were part of a society that certainly did – and on an industrial scale. Britain, with its unique reserves of tin, was a Bronze Age powerhouse. And for a society to flourish and an industry to grow, there has to be trade, social movement and a market for goods. There has to be structure and the exchanging of ideas. There has to be education. And one of the products of a blossoming and successful society such as this is its art – the remnants of which we see around us on this moor. And art it most certainly is. Cup and ring carvings dating from the late Neolithic period, through the Bronze Age and into the Iron Age, have been found across Europe in caves, on rock faces and on standing stones. In recent weeks, six wooden Bronze Age boats – perfectly preserved in peat – have been excavated in Cambridgeshire, some with extensive carvings along their sides. So it wasn’t just stones these blokes were decorating. Art found its outlet on many items, including tools and weapons. So this is where we’ve ended up with our little experiment. 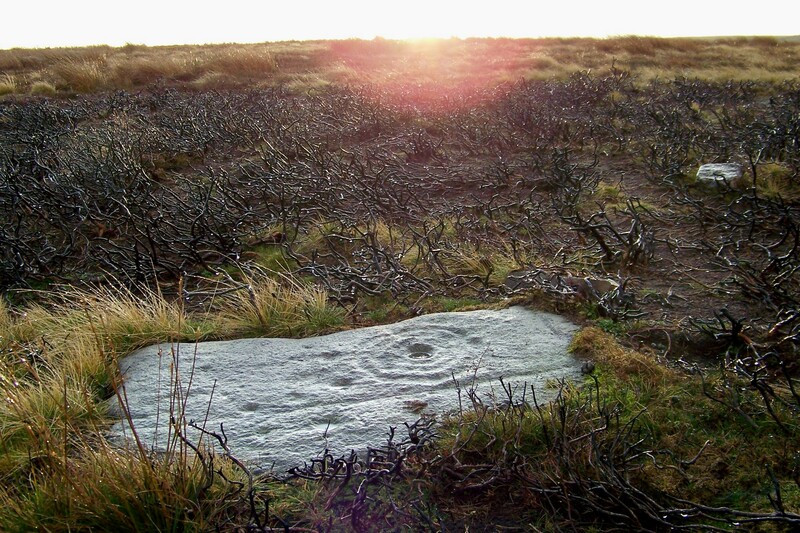 I’m standing on an empty moor with a scattering of carved stones and a line of grouse butts. It’s a bleak place on a wet and windy day, I can tell you. But it wasn’t always like this. Three-thousand years ago, or thereabouts, it was an important location overlooking one of the major routes across the Pennines. The people who frequented this ancient place possessed the ability to craft precision tools from minerals dug from the earth. Like us, they had knowledge and possessed skills. They were chemists, metallurgists and technologists as well as warriors and farmers. They had a complex society not unlike our own, a society that advanced through scientific discovery and the development of industrial processes – and they valued art as we value art. In fact, the only thing that separates us from them is 3,000 years and a language. But what do the cup and ring markings represent? Dunno. I don’t have the answer to that. What does the Angel of the North represent? What do the gargoyles on York Minster represent, or the lights on Blackpool Tower? Or Blackpool Tower itself? Man’s exuberance, perhaps? His need to create for the sake of creating? His desire to express himself? If so, why are cup and ring markings found across many countries? Are they, as some archaeologists have suggested, among the earliest attempts at a written language? Or do they symbolise gods, wells, planets, ownership, social standing, birth, death? Again . . . dunno. What I do know is that the men – or the women – who carved these stones were living, breathing, sentient beings, every bit an integral and important part of a functioning and successful society as we are of ours. And that’s what stirs me about this place. That’s what provides the link with the past. There’s a smaller carved stone a few feet from the big one. 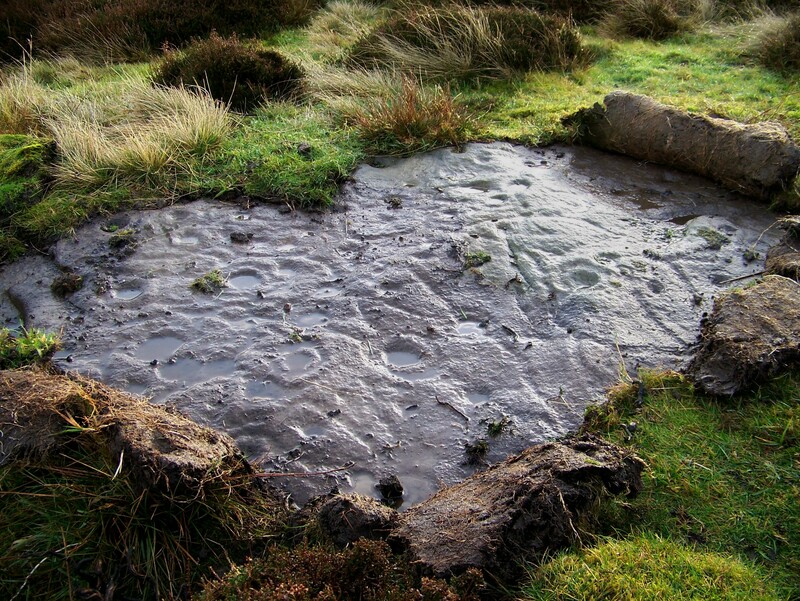 Another lies on the bank of a stream about thirty paces to the south-east, and I find a flat slab with fine cup and ring markings a hundred yards to the west near the grouse butts above Washbeck Gill. 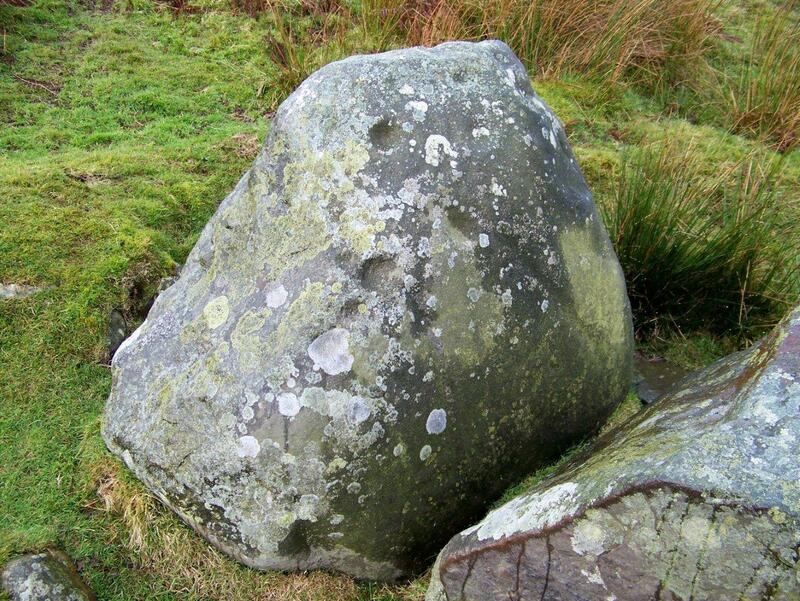 About half a mile to the north-west, above the steep banks of Scale Knoll Gill, is a group of boulders, one of which has been carved. Further to the west again, above a fork in another gill and not far from the edge of The Stang forest, is a small boulder with three or four cup and ring markings carved into it. This is as far as I get. According to my research, another two stones lie on the very edge of the forest. And god knows how many are hidden in the mossy ground beneath the trees. Only the Bronze Age folk know where they are. I might have to consult them. And now I’m off home because I’ve found what I wanted to find. It’s taken some time, but what’s a couple of weeks out of 3,000 years? And I still haven’t made that chisel. 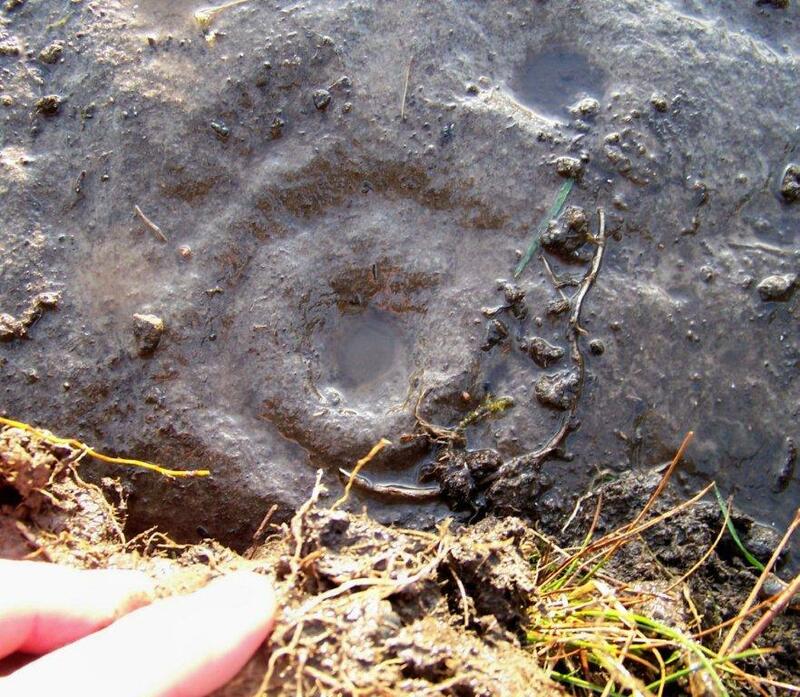 This entry was posted in Archaeology, Bronze Age, Cup and ring carvings, Environment, Geology, History, Industrial archaeology, Mountains, Stone Circles, Walking and tagged Lake District, Mining History, Pennines, The Lakes. Bookmark the permalink. 28 Responses to The Circles that You Find . . . Thank you, takes over doesn’t it ? Hi Danny. You’re dead right it does. Wow! What a fantastic post, thanks so much for taking the effort to do all of that as it is quite inspirational. I too am filled with awe (or perhaps it should be ore) with these relics. I’d love to know whether the carvings were a male or a female occupation. And just out of interest, I wonder how long it would take you to carve just one small ring using a suitable (of the period) tool. Ah now, Mr Griffiths, I was toying with the notion of having a go at carving a ring or two – not on one of the above stones, but on something suitable that’s not going to upset anybody. During my research I discovered that you can actually buy copper chisels. They are used in environments where sparks would be a danger – coal mines and explosives works, for instance. So I might invest in one – because I’m certainly not going to make one. Good to hear from you. Why not make one? You could try using short lengths of 15mm copper pipe, either as it is or squashed – or even copper nails. I suspect that an industrial copper chisel might be alloyed with tellurium, tungsten or something else exotic in order to make them tougher and thus belong to a somewhat different technological era! Either way, I think you’d learn that technology has made us forget the principles and skills of being patient. You’re right, Colin. I’ve just looked into it and seen some that are a copper-beryllium alloy for hardness. There are plenty of websites out there detailing Egyptian copper and later bronze stone-cutting and carving chisels and an interesting flickr page of a couple of blacksmiths recreating Egyptian chisels here. This started as a Saturday afternoon stroll with the wife and has evolved through Bronze Age archaeology and into the history and development of metallurgy. I suppose that the copper and bronze those ancient chaps were producing was full of impurities, so perhaps a sprinkling of beryllium wouldn’t go amiss. Meanwhile, I shall look into it further because there are loads of avenues to follow and they’re all interesting. 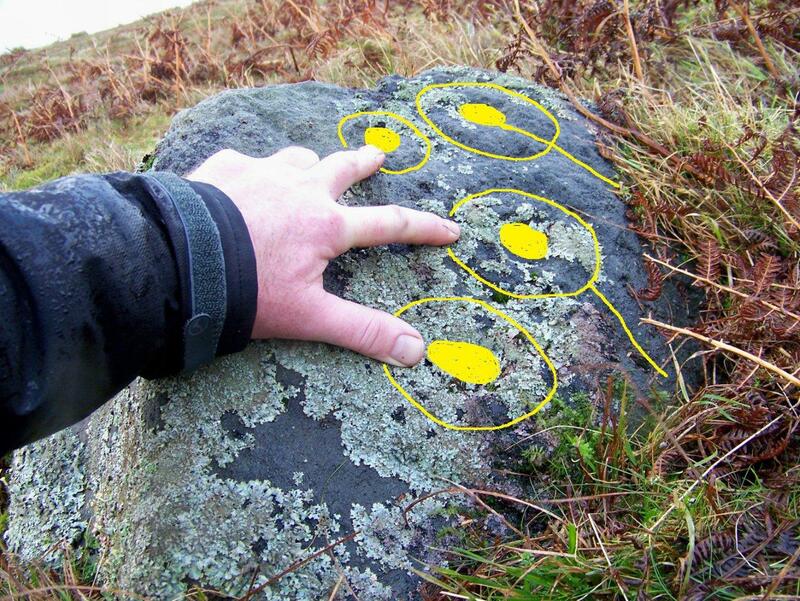 Looking at the main stone – it reminds me of a map of hut circles. The lines could be paths or fences. The moors back then would have been a much warmer place than it is now and settled and farmed. It’s almost a town plan – I wonder if the concentric circles are the “You are Here” bit? Hi Alan. That one had crossed my mind too – a visitor’s guide to the local town centre. I don’t think we’ll ever know the answer to that one. Still on that theme, Alan, they could be plans of burial sites or marking individual graves themselves. What is also interesting, and I forgot to mention in my post, is that they are all positioned on the brows of hills, or just below the brow where there is an open view down to the Tees. I am reminded of Jimmy Savile, who insisted on having his coffin buried at a 30-degree angle in Scarborough churchyard so he would have an uninterrupted view of the sea. I wonder of it’s not more to do with the aspect of the slopes and the view they command. Many of the panels north of Wooler are looking out towards the Cheviots to the SE.. Some such as Roughtin Linn are in valleys above waterfalls. I’m sure water has a vital link to these stones, carried on through the ages since early times. The Romans were at it as well with their votive offerings to springs. Even Arthurs sword was tossed in a lake….apparently. Lovely stuff and an area I’ve yet to visit…but I’ll be coming. Did you find that the stones and panels are favouring any specific directions? Facing the setting sun perhaps. I reckon it was a Bronze Age pub and the panel a games compendium..
Hi Pete. They’re all either at the top of or part-way down northern slopes overlooking the Tees valley. Bar billiards I reckon. Another compelling read Alen. 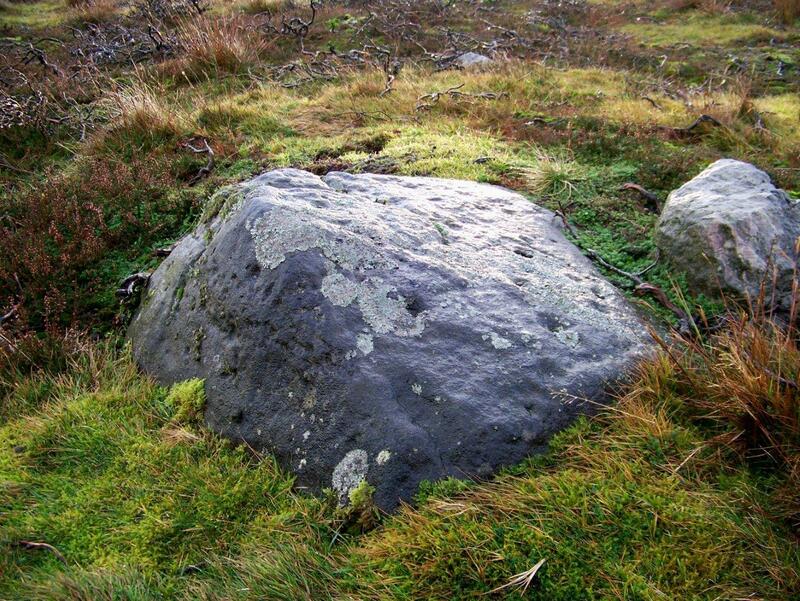 I really love all the theories that our modern day imaginations create as a result of these stones. When I walked around the moor with my wife the other day we spent ages staring at the carvings and then looking out across the Tees valley towards the unseen coast where the sun would rise in the summer. It was easy to visualise the landscape covered in woodland with perhaps any high ground cleared of trees – possibly even wood smoke rising here and there from some of the closer homesteads. It is the sort of place that does that to you, it tends to fire the imagination for some reason. I will have to spend time exploring a few of the other sites spread around the north and elsewhere now. It would be great to see your modern day attempts at rock art if you do decide to have a go. Hi again, David. You’ll have to get a comment facility set up on that site of yours. I really enjoyed that, not least because we appear to have arrived at parallel conclusions about the society and its people. Interesting to see there are a lot of similar theories pointing in similar directions. One of them must be on the right course. Yes, they were true artists these people, and obviously part of a movement – religious, artistic or otherwise – for their work to be so widespread and to have been active over such a long time span. I’m not so sure about Osmaril’s Head, mind. But if I’d spotted it I’d have taken a picture too! And that cave sounds interesting. I hope you’re going to elaborate on it at some time in the future. “You’re right, Colin. I’ve just looked into it and seen some that are a copper-beryllium alloy for hardness”. Beryllium makes a huge difference. Both beryllium copper and hardened steel harnesses are measured on the Rockwell C scale, around 30c and 56c (typical chisel hardness) respectively. Soft copper has to be measured using Rockwell B, typically 40B where 1C would be the equivalent to about 80B so soft v beryllium alloy are in different leagues. I’ve used beryllium copper for thrust washers and shafts and it’s very tough. I’d forgotten about it’s use for various tools in hazardous environments. Your research into this is very interesting. Brilliant blog. I should add that Barningham Moor is an important conservation area for ground nesting birds, so anyone following the grid references should do so carefully. There was and still is I believe a good display in the Bowes Museum from How Tallon. 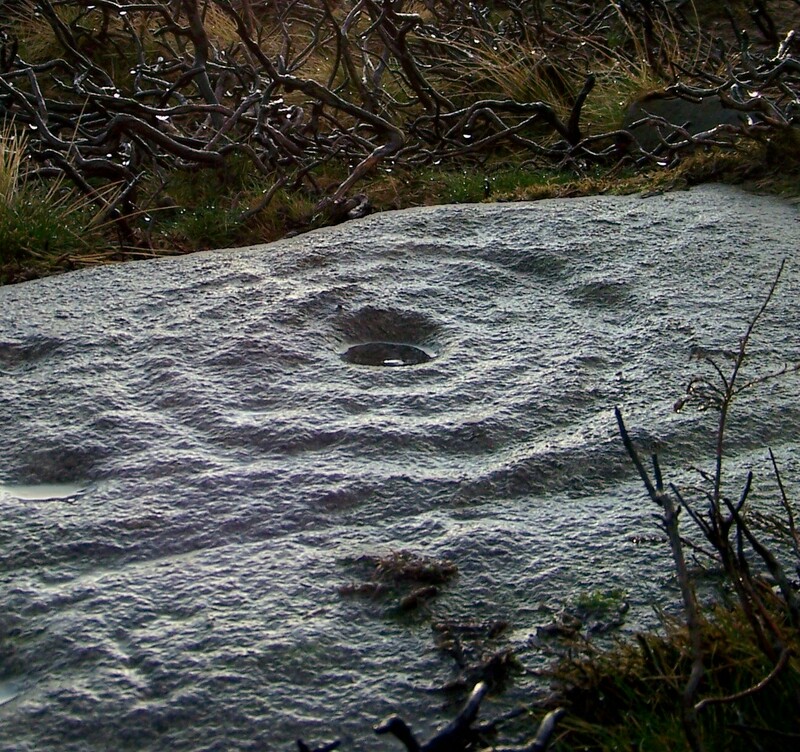 Presonally, I’m still searching for the carvings in Deepdale Valley at Low Crag. Thanks very much for that. That’s useful information. I didn’t know about the Bowes display – that’s one for a wet Saturday afternoon. Cheers. Alen. Danny, you’re a star. That is absolutely fantastic. Thank you very much. Your writing is mesmerizing. I was drawn to your every word, wanting to be there, kneeling with you, touching the stones, breathing in the air of 3000 years ago. Some day, I would like to come and see these for myself. Thanks for those very pleasant words, Linda. I’ve had a look at your blog and I like the idea of keeping chickens. It’s something my wife and I have talked about for some time. I think we’re due another talk. Spellbinding Alen. Thank you much for this taking me along this trail. I’d near forgotten my bronze age family and how much they had left for us. You have opened windows not only on the past but future horizons I may venture towards. Great admiration for your writing. Mahalo. Thanks very much. It’s great to hear from someone on the far side of the world with different traditions and culture. Alen. Hi John. I don’t know if any excavations have been done around the stones themselves, but some burial mounds in the vicinity have certainly been studied. Also, there is a large mound of burnt material on the moor dated to the period that has also been excavated, but I am not aware of any conclusions that were made. It would be interesting to know if there was anything under them, and the thought has certainly crossed my mind. Hi John-Paul. Thanks for your comment. I like the idea of the stars and planets because, as you say, the heavens would have been a huge influence on an ancient people, as illustrated by Stonehenge and countless other ancient sites which appear to be aligned to certain celestial events. Perhaps one day we will know for sure.